Over a lovely picnic lunch with some other Cam23-ers today, it was mentioned that it wasn't clear how to change the 'posted by' name at the end of Blogger posts. I've dug around a bit, and think I've worked it out, so here are some instructions for anyone who's interested (feel free to share the link). 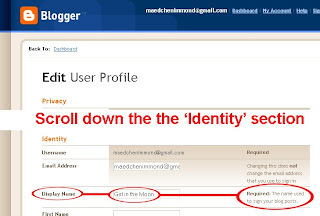 1) Go to http://www.blogger.com/ and log in, or navigate your way to the Blogger dashboard in any other way you like. 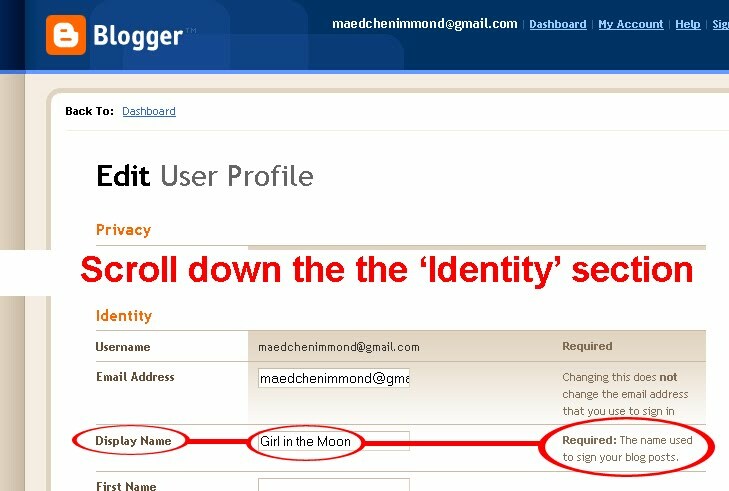 3) Scroll down a bit on the new page until you reach the 'identity' section, and then look for the 'display name' option. 4) Type in the display name you would like, and then scroll right to the bottom of the page and click 'save profile'. What does Update say about CILIP? A theme in some quarters of the CILIP Conversation, and certainly of our conversation in Cambridge, has been the perceived inadequacies of the CILIP publications. I must confess to not being an avid reader of either Gazette or Update, although I do try and flick through each issue to keep up with what's new. I don't think that the content is necessarily as engaging or relevant as it might be, but I haven't yet managed to form any definite ideas about what I think would be better. This post is about the medium itself, and what message it conveys. It's the online versions (CILIP membership required) of the publications that have attracted my attention, and not in a good way. I shan't enter into debate about whether its better to have CILIP publications in hard copy or online, except to say that there certainly should be an online version available. And given that there is an online version, it really ought to be good. As one of the main means of communication of CILIP with its members, I really expect the magazines to embody some of the ideas and principals that librarians and information professionals are implementing and promoting in their work. Do Update and Gazette currently meet this ideal? To my mind, no. Last month I took some time to read through Update online, and I found several things which I think could, and should, be done better. They fall into two broad headings: interface and searching. The Flash interface might look flashy, but I really don't understand what we as readers gain from having animated page turns, and even the sound of the page rustling as it flips over. This kind of effect is just naff, as far as I'm concerned. We all know what turning a page looks and sounds like, and the content would work just as well, if not better, without it. The Flash presentation isn't just a bit naff, it's also slow. Not everyone has a high-speed connection to a high-speed computer. Making people wait for pages to load will just lead to them not reading the magazine. The interface isn't just naffly presented and slow, it's actually inaccessible to many. Flash isn't supported well on all operating systems (honk if you use the latest Ubuntu release), won't be installed on all computers (and in a work setting, it might not be possible to have it installed), and readers with motor and/or visual difficulties might not be able to use it at all: there don't seem to be keyboard shortcuts for all the functions, and Flash can't be interpreted by screenreaders. 3. I access the internet at work where we don’t have Flash and I’m not able to install it. How can I access Update? Flash is an industry standard software solution. Some organisations require their staff to make a valid case before they will install Flash on networked computers, so this is a good opportunity to do so. Update Digital delivers high-quality information of direct relevance to members’ work activities, and access to it is restricted by log-in. If it is not possible to have Flash installed on your network computer, it may be possible on a laptop or netbook. Otherwise access may need to be from your home pc or laptop. Longer-term we are investigating whether Update can be provided online via Apple’s iPhone/ iPad or Smartphones. 4. I have a disability (e.g. visual impairment/poor motor control) and find that I cannot use Update Digital. How can I access Update? You can zoom in and magnify the text by clicking on the page. You can also print all the pages by going to Menu and choosing Print pages. When the thumbnails have loaded, choose Select all to print all the pages. Our software developers are working on speech-activated controls and text-to-speech, but these are not yet available. I find these answers dismissive and patronising. CILIP ought to be making obvious efforts to make its magazine content available to as many of its members as possible, seeing as they have paid for it, rather than implying that members' complaints are unwarranted. There are other 'industry standard' solutions that could be used for the dissemination of online magazines that have better accessibility options for disabled people, and which are more widely supported. The suggestion that CILIP have people working on making the current interface accessible via speech-activated controls and with text-to-speech capabilities is confusing. These are solutions that are already available in other platforms (an HTML version of the magazine, for example) why are CILIP trying to re-invent the wheel? Assuming you can gain access to Update in the first place, can you find what you're looking for inside it? Well, the online-only issues have a clickable contents list, although those issues that appear in print form too, don't (although the weblinks in those versions can be clicked). But even without a clickable contents list, finding items in an individual issue isn't too onerous. Electronic publications really have the edge over print when it comes to searching archives: the possibiliy full-text searching ought to make it possible to find whatever you want. This isn't really the case with Update online. For starters, two different search boxes appear depending on where you are in the interface. When you're in the archives page, click the 'search' button in the bottom right, and a small, Google-style search box appears. But when you're looking at a particular issue, click on the search button now at the top right, and a better search box is brought up, with options to limit searches and witha help screen explaining different search possibilities including phrase searches and truncation. Optimistically, and interested in what CILIP had to say about the recent merger of archives bodies, I entered a search for 'Society of archivists' with limits of 'all editions', and requesting the results bedisplayed 'by edition'. I was hoping that 'by edition' would give chronological sorting, but alas, not. The results appear to be grouped by edition, but the order of the editions is obscure: some Masters supplements, Jan-Feb 2010, March 2009, September 2009... It carried on like this on the second page of results, although today the same search returns no results at all. If there's logic here it's too advanced for me. "We're not interested in reaching our full audience, and we don't want you to be able to find anything in the archive". 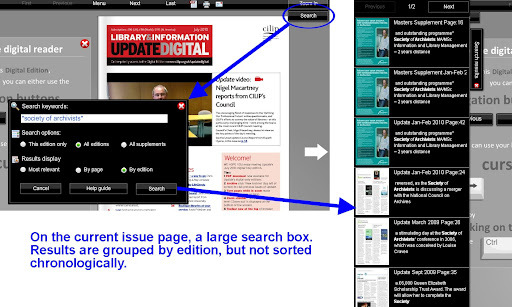 No wonder librarians and information professionals are so infuriated with CILIP! Things 9 and 10: "See'st thou this sweet sight?" This post is late and disjointed because I've been swallowed whole by the Flickr ministracts pool and am still struggling to surface back in the real world. (As evidenced by my accidental publishing of my notes for this post. D'oh!) It was all the fault of Sir Cam's interpretation of Nick Turvey's sculpture 'Chief' at the Fitzwilliam Museum's Sculpture Promenade, so I'm fully blaming the Cam23: they recommended him. I've used Flickr for my personal photos for a while, and don't have any complaints about it as a tool for organising (both heirarchically and with tags) and sharing images. Elsewhere across the Cam23-o-sphere (do you think that name will catch on?) a few posts about Flickr have caught my eye: I disagree with Andy Priestner regarding the necessity (or otherwise) to credit photographs used online - I think it's bad manners not to, so I always try to include credit, at the very least in the alt and title tags on images; Isla analyses well the difference in utility between Flickr and Google; and Helen concludes that Flickr might be good, but it's not for her. Vanessa Lacey wonders if Flickr could be used to promote retrospective cataloguing projects, and these institutions provide interesting models for collection and project promotion via Flickr. Oh, I Wordled, too, with text from A Midsummer Night's Dream. Wordsearch fans, have a look for 'dead athenian snout' (click on the pictures to make them larger). 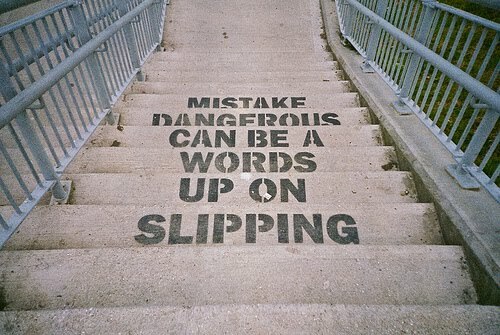 A top Wordle tip is to right-click on words that you want to remove. P.S. To show I can do the searching-for-creative-commons-licensed-photos-Thing, here are a couple of licensed pictures that caught my eye. Other eye-catchers (licensed and otherwise) can be seen in my galleries and my favourites (ongoing projects, both). I just hit 'publish' instead of 'save' by accident, and have sent a partially-formed post out into the ether. So glad I didn't say anything rude in it. I think. A better post will follow at some point. This is the first part of my report about a discussion between health, academic, business and school librarians held in Cambridge on Tuesday 22 June as part of the CILIP Conversation. Part 1 is all about CILIP and part 2 is about the future of libraries. Lots of the other participants have also reported: Anna, Anne, Isla, Niamh, Sheila, and Jenni. What do we think about the Conversation? CILIP asked us to say what we think will happen in 10 years time, but we really can’t do that; it’s a job for futurists. What we can do is to evaluate what has changed in the last few years, and how this might develop in the next 1, 3, or 5 years, and we could have been asked about this in more detail in the survey. We really didn’t like the CILIP survey much ; it felt irrelevant and lacking in detail. Some of the questions just didn’t even make any sense at all, such as ‘do you think that expectations of your role are increasing’. We also wanted more detailed questions about what we want from CILIP. What do we think about CILIP? CILIP feels distant, remote and irrelevant to many - particularly those working in business, school and health libraries – it seems like Update and Gazette have little that reflects our working lives. The principal of chartership is worthwhile, but there was opposition to having to remain a member of CILIP for life to retain it. Personally, I understand this objection, but I suspect that this is the case for most professional bodies and that it isn’t just a CILIP issue. CILIP CPD courses are expensive. Many people were very impressed with the courses organised by special interest groups, at very reasonable prices, although it was noted that speakers for these courses are often only paid travel expenses. CILIP courses are much more expensive than those from other similar professional bodies such as the Museums Association, and they’re not reliably good enough for people to want to risk spending £400 to attend them. CILIP’s building in London is very unpopular; issues regarding its costs and value have been addressed elsewhere. We read Update and Gazette for the job advertisements, and some people (those training and chartering) try to read it all, but we don’t find much that is relevant or interesting to us. The job advertisements are sometimes for such poorly paid jobs that we wonder whether CILIP should be advertising them at all. It was also noted that it’s so expensive to advertise in Update and Gazette that many jobs are missing. It was thought that there could just be one CILIP magazine, possibly delivered online only. (I have a lot of thoughts about the online magazines, and the CILIP website in general, but I’m saving them up for another post.) It was even suggested that the magazine format could be dispensed with in favour of personalised news bulletins. There is an e-bulletin feature already, but there’s not a lot of refinement to it. So why do people continue to pay for membership? Some jobs do need chartered status, and for professionals without an LIS degree, chartered status is important evidence of competence. People couldn’t praise the special interest groups enough – they seem to make membership worthwhile. We want it to advocate for us, and to have good PR abilities and a strong public and media profile. The Royal Institute of Chartered Surveyors was mentioned; we’d all heard spokesmen from it on the TV and radio. We really want CILIP to have someone whose job it is to appear on Newsnight, instead of making excuses about how hard it is to face up to Jeremy Paxman. We approved of Phil Bradley’s idea that it would good to see a proactive CILIP that gets things wrong sometimes, instead of seeming to sit back and let us get on with it. The example of Micahel Rose advocating for children reading was made. Andrew Motion (chairman of the MLA) wrote in 2008 about libraries in a way that suggested he hadn’t been in many recently, but he has been speaking up for them in the last few weeks. His opinions may not be nuanced enough to capture all the issues that concern librarians and information professionals, but CILIP could benefit from having someone similar to make a public impact. This is the second part of my report about a discussion between health, academic, business and school librarians held in Cambridge on Tuesday 22 June as part of the CILIP Conversation. Part 1 was all about CILIP and part 2 is about the future of libraries. Other peoples' reports are also available: Anna, Anne, Isla, Niamh, Sheila, and Jenni. There was some debate about whether libraries and librarians need to rebrand as ‘Learning Resource Providers’ or something similar, but this term seemed far too narrow. Maybe there’s something else we could call ourselves, or maybe we just need to be clearer about what librarians do. Librarianship is helping people to work what question they’re really asking. The emphasis was very much on personal interaction and support. The organisation of data can happen from anywhere, but user support and training is best done face-to-face, and one-to-one. This 1947 promotional film emphasises personal interaction in the role of the librarian. Why are we having to work to re-emphasise this now, when it’s surely never stopped being true? This level of personal interaction and help needs professional staff. There’s definite concern about the de-professionalization of public libraries, and in a similar way about also the closure of government libraries: what impact will this have in the long term? We discussed some of the ACRL predictions for future of academic libraries, in particular the idea that in 2025 there will be ‘no need to search’ (link to pdf page 16, item number 17 ). This ‘no search’ environment (we wondered if it would be something like foursquare, about which I know nothing) will surely require a lot of unseen work in the background, and it will need common languages and standards across all sources and platforms, and not continual re-invention of standards as we see today (apparently the Europeana project isn’t using Dublin Core standards for metadata but inventing some different standards [I've been corrected in the comments - Europeana are tweaking Dublin Core instead of using it straight, which is clearly better but still not ideal]). 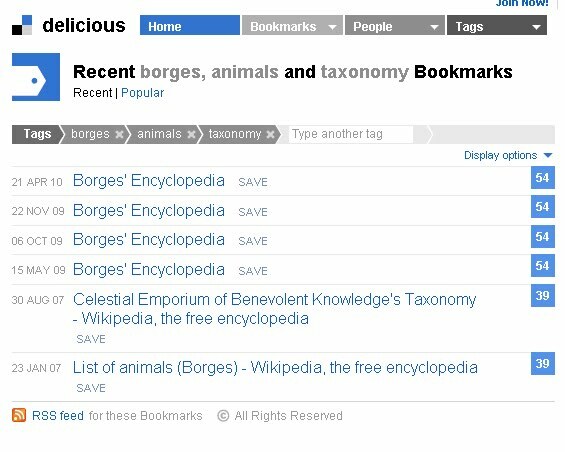 Librarians will have to keep interpreting what people say and want until the semantic web is very, very good indeed, and that won’t be soon! 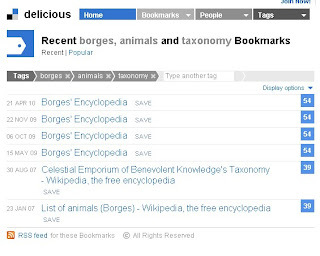 Users expect intuitive interfaces, and need to be shown that there are benefits to learning more complex search techniques. We ended the discussion by trying to imagine the future of libraries and information services on a more manageable timescale than the 10 years asked about by CILIP. If you have thoughts about what your library or service will look like in 5 years (both best and worst case scenarios! ), then please continue the discussion in the comments. School librarians can be very isolated. They rely on local networks, feel distant from CILIP, and unrecognised by teachers. School budget cuts means that there may be no money at all for CPD. School libraries will have to adapt to match evolving teaching methods and to provide tools to help students find what they need outside the physical library, as well as providing project collections of books for use in the classroom. There are currently not enough computer resources, but this might change as increasing numbers have their own laptops. Even with their own computers they will need help to locate resources online, and in the physical library. Subject librarians will have to know their subject more so as to be able to provide tailored search and indexing services. They might not need to be the academic, or doctor, but will need to speak enough of their language not to sound stupid, but to sound reliable and useful instead. Publications need more detailed metadata, for example about the precise materials used in engineering. This has to be added somewhere in the process, but it will be a lot of work, and it’s unlikely that author or user tagging is the answer. In five year’s time the physical library with books in it will still be here. Students are currently very clear that they want to have the physical space to work in, and not even all new academic books will be available as e-books by then, never mind the older texts that are still needed. Special collections are being digitised, but this can’t replace the importance of the books and manuscripts themselves, and will often lead to increased reader numbers through improved publicity. Digitisation also isn’t futureproof. Collect evidence of what we do in order to prove our worth. Ask our readers and researchers what they want from libraries: this might include help with copyright, and with getting published, more detailed enquiry answering about specific items (see Greening the material text). This is the only reason I'd used any Google application before starting 23 Things: to make a note of pubs I like. Pretty sad huh? But it's so easy to put together, and useful, too, with locations and notes all in one place and all accessible from any online computer/phone/gadget. 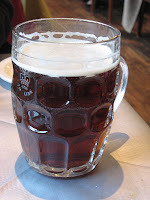 I could add links to pub websites, and tasting notes, and pictures, too, if I had the time. I must say that the clarity of Google mapping isn't what I'd always like (give me an OS or a Geographer's AtoZ any day), and I wish there was a proper pint glass icon to use without having to upload my own, but being able to draw all over a map like this is too good not to use on aesthetic grounds alone. 1) Go to the Google Maps homepage and sign in with your Google account details. 2) On the left-hand side, click 'My Maps', and then 'Create new map'. 3) Fill in some details of your map's title and description, and choose whether you want it to be public or not. You can always change the privacy setting later. Click the save button. 4) Now add things to the map! Click on the little pointer icon at the top of the map to place a pointer on the map, or search for something using the search box at the top of the page. Click on a search result pointer and then on 'save to' to add it to your map. You can drag any pointer around to move it to where you want it to go, and click on it to add information, or change the icon shape. 5) To share the link to your map, click on 'link' at the top right of the map and copy the text. To embed it in a different website, click on the 'customize and preview embedded map' under the 'link' link. If you're really clever, maybe you'll create something as mesmerizing and useful as this (link from Phil Bradley on Twitter). Thing 8: "Peaseblossom! Cobweb! Moth! and Mustardseed!" Consider the eighth category, which deals with stones. Wilkins divides them into the following classifications: ordinary (flint, gravel, slate); intermediate (marble, amber, coral); precious (pearl, opal); transparent (amethyst, sapphire); and insoluble (coal, clay, and arsenic). The ninth category is almost as alarming as the eight. 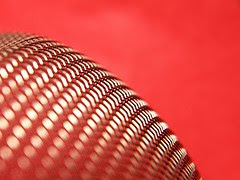 It reveals that metals can be imperfect (vermilion, quicksilver); artificial (bronze, brass); recremental (filings, rust); and natural (gold, tin, copper). The whale appears in the sixteenth category: it is a viviparous, oblong fish. These ambiguities, redundances, and deficiencies recall those attributed by Dr. Franz Kuhn to a certain Chinese encyclopedia entitled Celestial Emporium of Benevolent Knowledge. On those remote pages it is written that animals are divided into (a) those that belong to the Emperor, (b) embalmed ones, (c) those that are trained, (d) suckling pigs, (e) mermaids, (f) fabulous ones, (g) stray dogs, (h) those that are included in this classification, (i) those that tremble as if they were mad, (j) innumerable ones, (k) those drawn with a very fine camel's hair brush, (l) others, (m) those that have just broken a flower vase, (n) those that resemble flies from a distance. Jorge Luis Borges, 'The analytical language of John Wilkins' in Other inquisitions, 1937-1952, trans. Ruth L.C. Simms (Austin: University of Texas Press, 1964), 101-105, p. 103. I met this quotation in a lecture about classification at UCL. The vivid imagery is a tonic for a tired mind and the quotation is certainly a useful tool to illustrate the deficiencies of a poorly-assembled classification system. The conclusion of the short article from which it is drawn is in fact that it is not really possible to construct a universal classificatory system for the world, and that any attempt will be too subjective and insufficiently comprehensive. But I like this quotation particularly for the way it, especially the extract from a fictional Chinese encyclopaedia, invites the reader to imagine a world in which such an impossible taxonomy makes sense. Can we envisage a Chinese court in which the significance of animals is defined by these arbitrary-seeming categories? And, to sufficiently foreign eyes, how arbitrary would our everyday groupings also seem? This distinction, between arbitrary-but-locally-appropriate and aspiring-to-universality-but-failing-in-the-details is not a new one in classification, but allowing Members of the Public to publicly create their own classification systems and to assign classifications to collections held by institutions seems to be at the heart of interest (or concern) over the phenomenon of tagging. These are points made in the Clay Shirky article (required Cam23 reading). I've read it, and it's inspired many of the thoughts in this post, but I won't be engaging with it in detail here. Less poetic than Borges, certainly, but not necessarily any less arbitrary: mostly they describe the content of a photo at randomly varying levels of detail (viz bird vs cockerel); one describes reason for taking - an occasional seires of photographs of wherewehadlunch; and two are, I suppose, metadata - photos taken in closeup, and photos I'm thinking of printing as cards with moo. My tags for this blog are a mixture of factual and whimsical. '23 things' is in there as a tag so that I can split posts about things from posts about government cuts, charteship, CILIP and the weather. 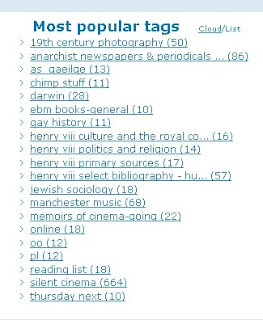 Humurous content tags 'I only listen to radio 4', 'when I was young', 'outraged of Cambridge' might help new readers to get a flavour of my writing without having to read a post. Or they might, in a few weeks' time, just look naff and annoying. If that sort of thing does float your boat, do have a look at the #regionaltagging discussion [archive at http://twapperkeeper.com/hashtag/regionaltagging] on twitter and discussion and tags on other blogs. These 'personal' tags are one end of the broad spectrum that Shirky discusses with regard to the benefits of letting users define things in their own language. The Skirky article suggests that we can do away with hierarchy and order in classification, and this is something that I'm reluctant to agree with. Sometimes a hirearchical and/or ordered structure is the easiest to find something, or to evaluate what somethings are available. I do use traditional subject sheadings to find content (I even used the UL guard books once because they have a grand list of liturgical books ordered by type of book, Use, date, etc. and I was looking for a Sarum Use missal from as near to a particular date as possible. I've still not worked out how I could have done that more easily in Newton). And for as long as libraries have things on shelves, it will be useful for the broadly related things to be broadly near to each other, even though we'd need n-dimensional L-space to get all related things into physical proximity. Combining tagging and traditional approaches is probably the best way forward. This is happening at Ann Arbor District Library, and also on the new British Library catalogue in beta. 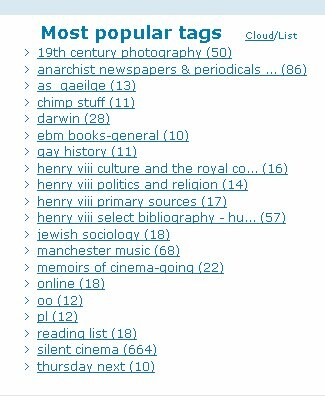 The success of user-tagging in these contexts rests on users actually adding tags, and it's clearly still early days for the BL. 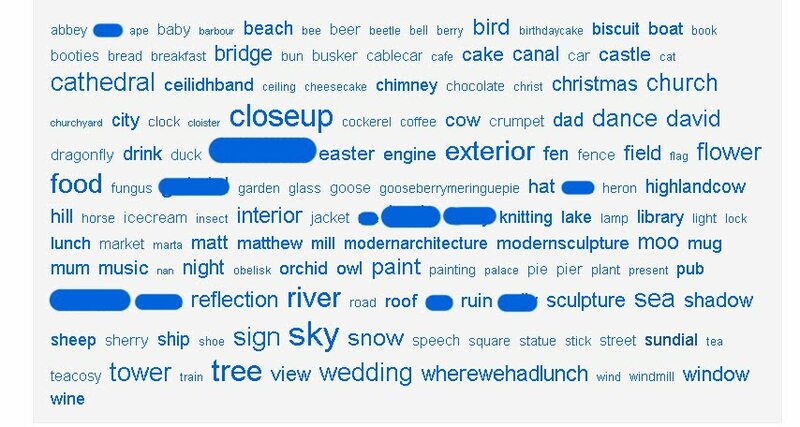 Using tags to discover content is an interesting, almost stream-of-consciousness experience, and can lead to unexpected discoveries, but I think the mechanisms need to get better. 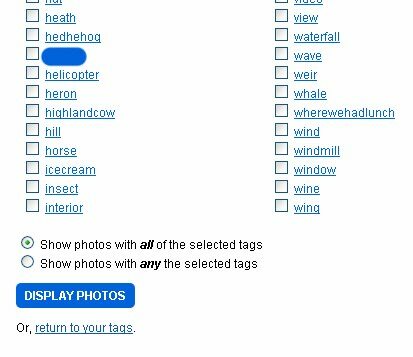 I want to be able to search for things tagged with several tags all at once. Can I do this easily now? Not everywhere. I can on Flickr, and very easily Delicioius, but not on Blogger and not obviously at the BL or Ann Arbor. It's not enough to have a search box into which I type some words, I want to be able to highligh multiple items from a list and see if they all apply together to something, and I don't think that this should feel like an added bonus feature. Thing 7: "So quick bright things come to confusion"
My first response to signing up for any new service or gadget appears to be to customise its appearance to suit my tastes (or to match my personal brand). So I fiddled around with my profile page until it looked like my blog, and then, because that didn't work too well with the twitter logo, I fiddled around with my blog design until a happy middle ground was found. Brand image consolidated, I spent quite a while looking at the other #cam23 tweeple*, as well as the #cilipfuture and #cilip1 discussions before actually diving in and tweeting myself. I've signed up to follow quite a few of the Cam23-ers, especially those whose blogs I've been enjoying, as well as a feed from CILIP, Phil Bradley, some librarians who have been making noise with the #cilipfuture tag, and (as recommended by Josh H) ArchiveAtBBC. I took a look at the British Library feed, but decided not to sign up because I'm not sure I'm interested in reading all the BL responses to followers. It's good that they're engaging in that way, but it doesn't draw me in particularly, and I'll stick to their press release RSS feed instead. Should you be interested, you can have a look at the full list of people I'm following. Or take a look at this nifty gadget recommended by Evaluna. Life moves very quickly on Twitter, and I wqnder if I'll find that quite difficult to take in the longer-term, when the novelty has worn off. I particularly liked evans_above's description of this feeling: "Like everyone is talking [to me] at once, and I'm spinning around wondering what? what? what?". I also wonder if there are ways of saving or bookmarking a tweet you want to come back to later? Maybe this is something that programmes like JournoTwit (as recommended by NPage) can do - I haven't tried it yet. Several people (e.g. nildesperandum) have been wondering what they're going to say on Twitter. I can't say that this has troubled me too much, though I'm not sure if that's because I like the sound of my own voice, or just because I'm quite happy to be a quiet lurker in the corner. Advice from several quarters has been to be to listen to other people and speak up when you hear something you want to share. At the moment, there is quite a tight circle of cam23-ers following each other, so it probably only takes one of us to say something and the whole group has heard it, but I'm noticing that other people and institutions (even the big, famous ones) that I start to follow seem to follow me back as a matter of course, and I suppose that they do this because having a wide network is the way that interesting information spreads most quickly. The use of hashtags seems to make it possible to create a community of people interested in the same thing, and to widen knowledge about that thing and get a buzz going around it. I'm not sure how often this is something that libraries want or need to do, although I'm thinking of trying to push an #opencambridge tag to boast interest across the summer and up to the open days in September. Sharing general news and info (e.g. opening times, new accessions, new discoveries (for special collections/cataloguing projects)) is certainly possible, and will reach a different audience on Twitter than with just a blog/RSS feeds. Although it seems that many of the people following library feeds are other librarians, and not library users, any library with a feed like this will have to be prepared to devote time and enegry to responding to followers. The BL seems to be doing this, but as Whispers in the Wildnerness notes, it might not be possible for all libraries. I've been on Twitter for a few days now, and certainly haven't hated it. But I'm not sure that I'm completely hooked, either. Can I really be the exception to the Marmite paradigm used all over Cam23 land this week to describe Twitter experiences? I'm reading some fun and interesting articles that people are tweeting about, and I'm learning a bit about what other librarians are thinking. But you have to work at it to get the most out of it, and I'm not sure I have the time. *One of the unfortunate things about Twitter is the vocabulary that comes along with it. Tweeple? Twub? Twapper? Twit? I'm quite nervous of trying to say one of the these infelicitous neologisms out loud because I'm quite likely to say by accident a word I wouldn't dream of writing in a blog that shares its 1st, 2nd and 4th letters with twit and quite probably appears in Chaucer. How unfortunate. A very quick post to mention that some interesting discussions are happening on some other Cam23 blogs. Further to this week's discussions of the future of public library funding, here's some news from close to home. As reported in this month's Libraries Newsletter (sign up for the newsletter yourself using the link at the bottom of the left-hand panel), Cambs Libraries, Archives and Information Service are being required to reduce their budget by 25% (c. £2 million) over the next 3 years. Details of council savings are given in the County Council's Integrated Planning Process. Thing 6: "When my cue comes, call me"
In the interests of testing out your Google Calendar skills, you are all invited to add the concert advertised yonder --> to your Google Calendars. And once it's in your calendar you'll all come to the concert, right? 1. You can see several different colour-coded calendars all in one view, making it easy to see what's a work event, what's a test match (for those of us left unmoved by this impending World Cup doodah), what's a social engagement, and what's the radio programme you can't bear to miss (although maybe that's redundant calendar use in the iPlayer world). 2. Google will remind you when your event is about to happen via pop-up message, email or text message/SMS. So there's no excuse for forgetting. Unless you're logged out of Google, with your phone switched off, and not checking your email. It could never happen! 3. Being able to share a whole calendar between people, so that a whole group of people can see what's going on. That's something we could really do with here, but it's likely that imperfect take-up would only make the current problem of multiple diaries worse, and not better. 4. Publicising a single event with a Google Calendar link, so that people can add it to their own calendars easily (have you added my concert yet?). Thing 5: "Meet me all by break of day"
There's not much to say about Doodle. It's useful for organising a large group of people without everyone drowning in a sea of mutually-contradicting email. To organise a meeting between four people in the same building it seemed a bit over-the-top, but at least we've all proved we can use it. At it's not just for meetings, oh no. The Librairan on the Fen Edge has used it to create a poll of Cam23-ers' ages (go and fill it in if you haven't already), and Behind the Curved Door Marjolein has polled friends on the name for an imaginary new dog. Q: How is a library like a charity shop? A: Both can easily be run by volunteers! Or so said Alan Downey, one of the authors of the KPMG report 'Payment for Success - How to shift power from Whitehall to public service customers', on this morning's Today Programme. 1. Mr Downey makes running a charity shop sound like a piece of cake. I doubt that it actually is. 2. People aren't falling over themselves to run charity shops as he suggests - several in the neighbourhood in which I live (not the classiest end of Cambridge) have recently closed, or are open only restricted hours. 3. Even given that running a charity shop isn't simple, running a successful library, especially in the areas where they are currently undervalued, is probably significantly more difficult. 4. If libraries (and other currently public-sector services) are going to be run in volunteers in the future, where are the skilled volunteers going to come from once the current crop of probably retired trained former-librarians has run out? So, what to do? Many people are tweeting about this, which I suppose engenders a feeling of collective dismay (much better than being miserable alone). I suppose I'd like someone (CILIP? the MLA?) to make a hard-hitting statement about the value of libraries and the importance of professional librarians, but I'm not so hopeful. Maybe I'll contribute to the CILIP Conversation ('Defining our professional future') on this topic once I'm feeling a bit more coherent. Edited to add: Better rants have been written by Elspeth Hyams and Bethan - go and check them out. Further addition: There's a post and discussion about this on the CILIP Information and Advice Blog and at Optimus Librarian. So, for this blogging-about blogging post, I seem to have an awful lot to say, so I've split it up under a number of headings. I can do little more than recommend two excellent posts on this topic from Magistra et Mater and Andy Priestner on this subject. I'm going to use this blog, I think, to record and reflect on things I've done. Comments are very welcome, but I'm not writing just to get reader responses. I think I'll also be trying to highlight posts and resources that I've found interesting and/or useful. Whilst setting up the blog was very straightforward, customising a Blogger template takes a bit of know-how and good luck. With a bit of previous CSS experience, I've managed to bully this into a shape and style I'm more or less happy with. I've tinkered about with the gadgets in the sidebar as well, most notably to add a feed of all the latest Cam23 bloggers' posts (see also below). The Add gadget window is frustrating because the search box doesn't seem to search the 'Basics' list of features - so if you're looking for a particular gadet, make sure you read through that list first! The photo-editing tools in Blogger also seem to leave a little be desired. Alt and title text can't be edited in the 'compose' view, it seems, which I assume will mean that most people don't bother with it. It also doesn't seem possible to chose a picture direct from a Picasa album, without so to include a picture that's already uploaded I've been copying the URL of the full-size pictures and using that. This seems a bit fiddly - can someone tell me an easier way? 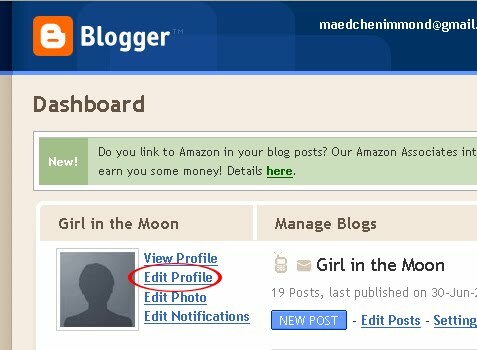 For arranging images on the page, it's worth following Marsh's advice and using the updated post editor. I've enjoyed commenting on blogs, although I think I've mostly been saying "that was interesting" and "I found the same thing", which doesn't necessarily generate interesting discussion. I've found out some useful things from Blurtmetry and 23 Criminal Things, and had some feedback from post authors. I think that libraries starting a blog for readers will have to consider that they'll need to set aside time for responding to readers' comments. I've taken the plunge and created a tool for other people to use. It's was very rewarding to find out that other people were wondering the same this as I had been - "is it possible to have a feed of all the Cam23 bloggers" - and that the solution I created was useful. I can see that combined RSS feeds like this might be a useful service that libraries could provide for their readers, perhaps tailored to different subjects or interest groups. The 23 Things blog suggested that we investigate other blogging libraries and librarians via the UK Library Blogs Wiki, but I haven't got round to that yet. It's on my to do list, though, as is also a reminder to investigate archives and museums blogs and rss feeds (tip o' the mouse to Adventures in L-Space, who notes that the Fitzwilliam museum has RSS feeds) as I'm interested in collaboration and common ground between across the 'MLA' sector. Would you like to follow all the Cam23 bloggers at once? Then follow this link to a shared feed (complete as of lunchtime today). 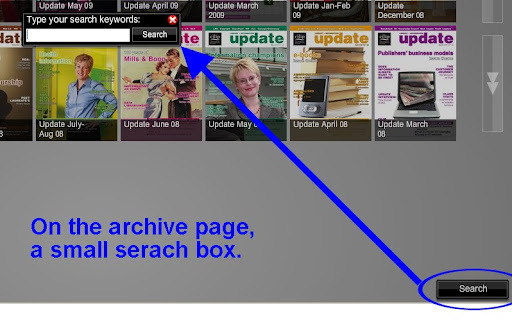 You can subscribe with Google Reader, or load the OPML file into other feed readers. I hope. Please let me know if there are any problems or comments - I'm very new to this creating content malarky and I'm very open to feedback. Edited to add: I updated the feed on Saturday evening (5 June) to include 9 new blogs, and will try to make sure that any further additions are also included. Please let me know if anything's missing. "Who will not change a raven for a dove?" 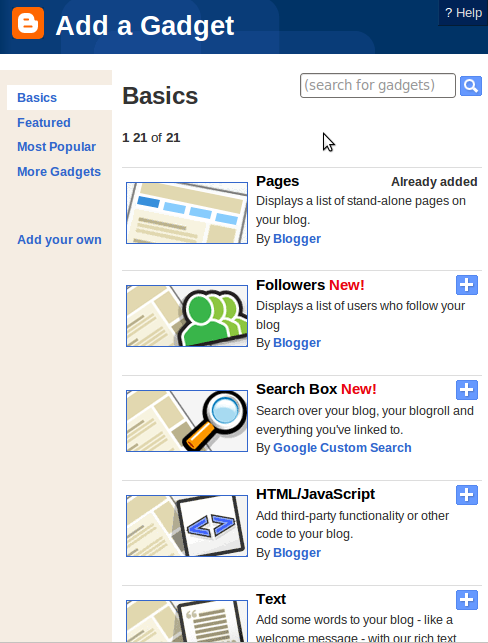 With a little more time to play with iGoogle I realised that it really wasn't going to meet my RSS needs. Although it can bring together several feeds on one page, they're still spatially disparate - you have to look at each one in turn to see what's there. Looking at them on one page is quicker than loading up each page from my bookmarks, but it's still not ideal. More annoyingly, I couldn't work out how, at a glance, to see which things were new, and which weren't. The links I've followed to source have gone purple (though that's not very clearin this screen shot), to show that they're visited links, but they wouldn't be if I were logging in from a different computer, or if my browser history on this computer had been deleted. And what about those stories I've looked at in the reader and not followed? I don't want to have to remember what I've seen and not seen - I want the tool to do that for me, and to show me clearly what's new! Things *are* clearer when I expand the gadget - the new items are dark, and the read ones are pale. But to check this out, I have to expand each widget in turn. 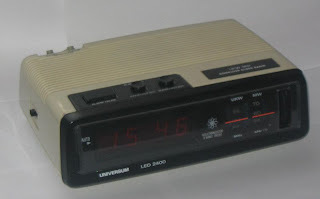 If you're still reading this far, you've probably guess where this is going... a feed reader. LottieMSmith recommended that I try Bloglines. I'm afraid I didn't follow that advice, and simply because I didn't want to set up yet another new account right now (having created all-new email and Google accounts for 23 Things). Despite my qualms about being logged into Google all the time (it feels a bit like selling my soul, somehow), I've set up a Google Reader account, and am loving it. 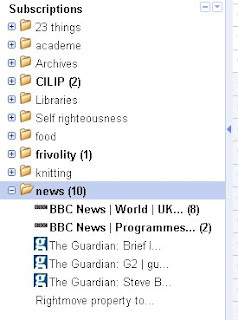 Although it isn't immediately obvious where some of the features are, there's facility to organise feeds into folders (hurrah for more categorisation! ), and you can choose to see all your new stories together in one window, or by folder, or for each individual feed. The overview of your folders and feeds on the left-hand side quickly shows you what's new where, and the overall feel is definitely of the internet coming to me, and not vice versa. Things 1 and 2: "A surfeit of the sweetest things"
Things 1 and 2 were setting up, building and adding RSS feeds to an iGoogle page. Here's the header of my iGoogle 23 Things tab. 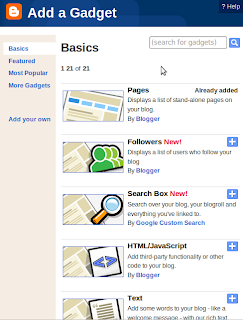 It might look a bit familiar as I've customised the iGoogle page and this blog in similar ways. Being able to customize the look of tools makes a big difference to me. I've never liked using default or standard designs for my computer desktop, for example, and with these tools I don't really feel like using them unless I like the way they look. I've set up a number of different tabs - home, work, chartership and 23 Things - to reflect the different sorts of resources I use for different things. I've been mindful of the comment that the gadets can take a while to load, so I'll be trying to keep the number of gadets on each page quite low. It's not necessarily easy to divide everything neatly into boxes; like the Mongoose Librarian, I'd count myself as one of the "people who like to compartmentalise their lives", but I also agree with Lottie at Adventures of a Librarian that it's all a bit more complicated than that. I'll probably soon add a tab (or tabs) for all my personal, non-work interests - the list of sites I like to check frequently is getting longer and longer and worthwhile causes keep getting forgotten. I really ought to try out Google Reader keeping track of the numerous blogs I follow; it seems to be what many people use, but it somehow feels a bit like cheating to let a tool like that do that hard work of checking for me! One of my tabs is ominously labelled 'Chartership' as this is where I'm keeping the sort of feeds that I've promised in my PPDP that I'll read, inwardly digest, and maybe even comment on. 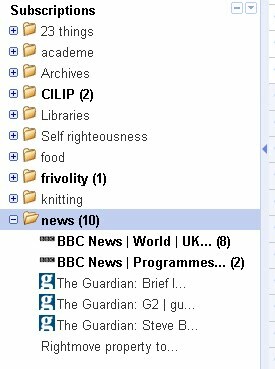 I've also added a bookmark to the CILIPfuture Netvibes page, and used the Feedcombine tool it uses to create a combined feed from the CILIP Conversation blog and the communities forums in the same tab. This is as much investigation of Netvibes that I've done, but it does look like a very useful tool for bringing together lots of sources in one place and I'll be back to look at it some more. In my 23 Things tab I've included the press release feed from the British Library and the Library of Congress main blog feed. The LoC has several blogs and even more news services, covering all its areas of work, and I was quite tempted to add them all. But, discretion being the better part of valour, I've just signed up for one and will see if I actually read it before I sign up for any more. I'm also going to keep a look out for other, smaller, blogging libraries to see how they use a blog and whether I think it's effective. Finally, I'm using the To Do List gadget to note down ideas and things to mention in blog posts. So if I'm getting a bit verbose, then blame iGoogle! Thing 3: "Let us listen to the moon"
Welcome, Internet, to my blog! I've set this up as part of the 23 Things Cambridge programme - a programme introducing University of Cambridge college and departmental library staff to Web 2.0. 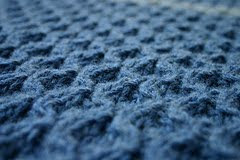 I suppose that I've been a consumer of Web 2.0 for some time, reading a few blogs (mainly about knitting and cooking), having a 'facebook presence', and using Flickr for my personal photographs. This involvement has been mainly passive; I've not been creating much public content nor commenting on other people's content. My reluctance to engage more online has sprung from my not having anything particular to say (and a fear of ending up like this stereotype), so 23 Things is (I hope) the ideal programme for me. I like structure, so having a couple of set Things to investigate each week suits me fine. The framing notion that we're investigating them with regard to their usefulness for libraries is also good - it makes this seem less like 'tinkering about', and more like a productive enterprise. I hope to learn lots of practical skills, but also to have a much better idea about which gadets are best for what. From my brief Thing-encounters so far I'm not sure that I'll find it easy to keep to thinking about library relevance, so hopefully the 23 Things blog will keep reminding me to do that!